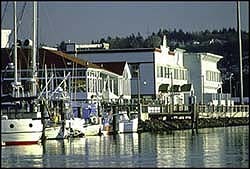 Everett lies along Interstate 5 on Port Gardner Bay, a natural landlocked harbor at the mouth of the Snohomish River. Across Puget Sound loom the Olympic Mountains; to the northeast and southeast, Mount Baker and Mount Rainier dominate the Cascades. The city was founded in 1892 as a transcontinental railroad terminus completed in 1893. A founder, Charles L. Colby, named the town after his son. Today Everett is an All-American City with a moderate climate and an abundance of natural beauty. Once owned by timber barons, mansions grace Rucker and Grand avenues. Jetty Island lies off the northern end of Everett's waterfront. Accessible by private boat, this man-made island is two miles long and is home to 45 bird species and a herd of California sea lions. There is also an Everett, Massachussetts. Everett is part of the Seattle-Bellevue-Everett, WA metro area.